Dam ... your farm looks so nice and organized. And your house is nicely decorated. I have next to nothing in my house. My farm is still mostly overgrown as I am continuously replanting trees after I chop them down in an effort to farm wood. My house is a wreck, but Leah doesn't seem to mind ... as long as I keep wine on hand. The farm looking organised is completely recent, trust me. It looked like a tip up until Winter year 2 when I took the opportunity of having finished everything else to spend real life days planning it out properly and getting it all sorted. The plants in the greenhouse got hacked apart because they were in the wrong place etc. Still not finished either! No need to replant oak and pine trees on your farm ... in fact, I consider them like weeds, which is why I put stone pavers around them to keep them from spreading. Just go chop down all the trees in the forest south of your farm (or anywhere off your farm); most of those trees are in static locations and they grow back pretty quickly. You can harvest all the wood you'll ever need and then some. 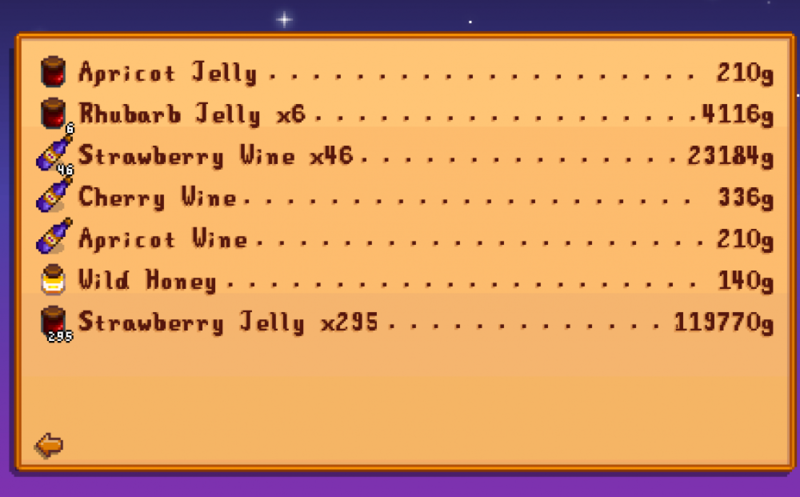 I only planted enough oak and pine trees on my farm to keep me in sap, and then I made sure they were lined up for easier collection. 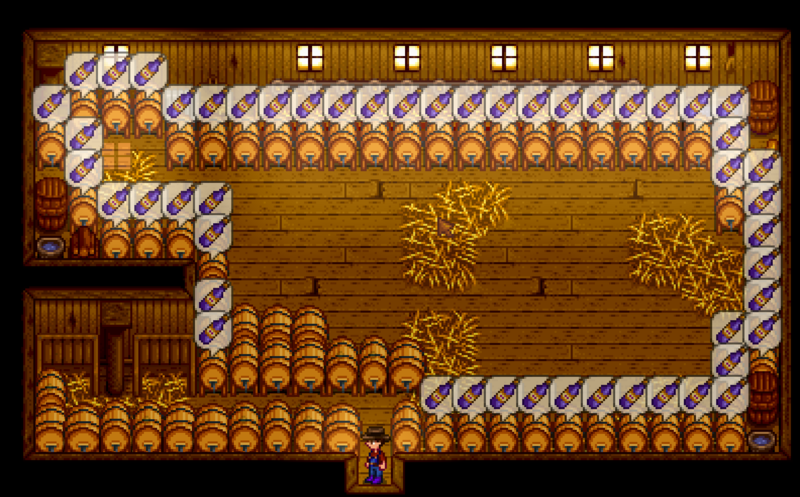 2 sheds full of preserve jars. 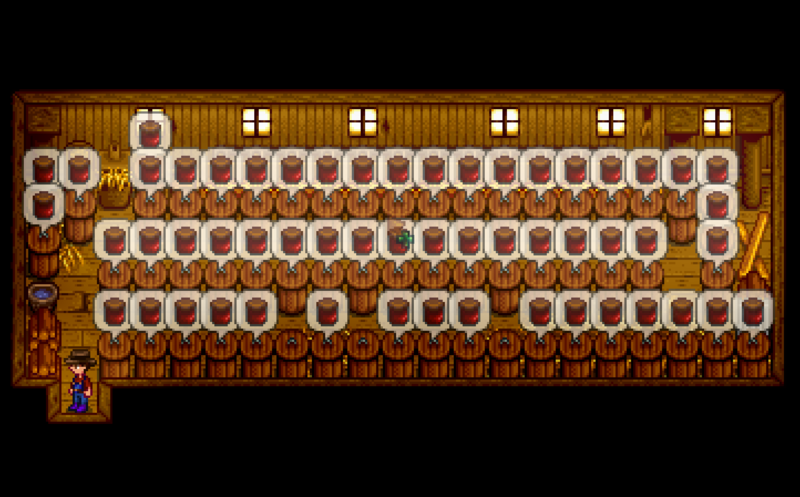 1 coop filled with preserve jars. Big Barn getting filled with Kegs. Basement is filling with casks. Come winter, my only todo is to rank foraging to level 10 (currently at 9). Outside of that, I'm sitting on a 1k cranberries and 800+ blueberries which will get me well paet winter with the kegs/preserves. I'll have that iridium statue from grandpa come spring. I'll also get my greenhouse in spring. Sitting on 30+ ancient fruit seeds. I have a wife and a kid. I can't spend my $ fast enough and I'm positioned to exponentially increase my earnings next year. I'll max out all my tools. Starting to think ... now what? I might aim to pretty up my farm and become a true commercial enterprise. Outside of that ... fishing? Did you get the bus line working? If so, you can visit the desert, and the casino therein after touring skull cavern. Then there's the sewers and the witch's swamp. That scepter of returning or whatever it's called that Krobus sells is awfully sweet but costs a cool 2 mil. IIRC, you can also work on collections ... items cooked, items sold, etc. ... and a second kid if you play your cards right ... or more correctly, if you give in to the incessant nagging. I keep dying in skull cavern. Next time I go there, I'm loading up on bombs. Thinking I will be there a lot over the winter. Love Krobus ... I get an iridium sprinkler every Friday. I will work towards getting his scepter. What keeps killing you in the caverns? The flying snakes have fairly large hit boxes, so swing early as they're incomming. If it is the mummies, I just knock them down and run past; you don't really get any experience for killing them and they're just a nuisance to slow you down. Oh and take the best weapon you can afford. Try to get the galaxy sword if you can. Fast swings for knock back and good damage. It was the mummies and me not eating food that killed me. Problem solved, I now have the Galaxy sword. Shard dropped one day after I bought the Lava Katana for 25k. However, turns out I went on a building spree and didn't spend much time mining over the winter. Spring Day 3 Year 3. 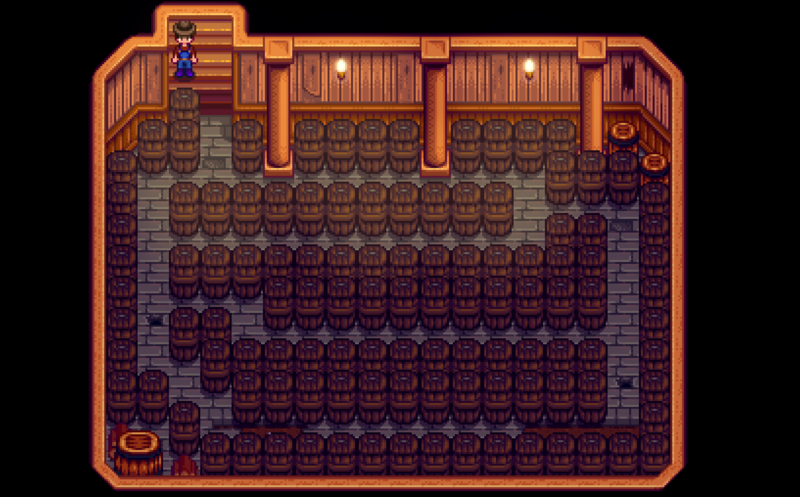 Basement is 2/3 filled with casks and my big barn is 1/4 filled with kegs. I have 4 sheds and 1 large coop filled with preservative jars (you read that right, I have over 300 jars). Smucker's would be proud. I preserved/pickled all my crops from last year. 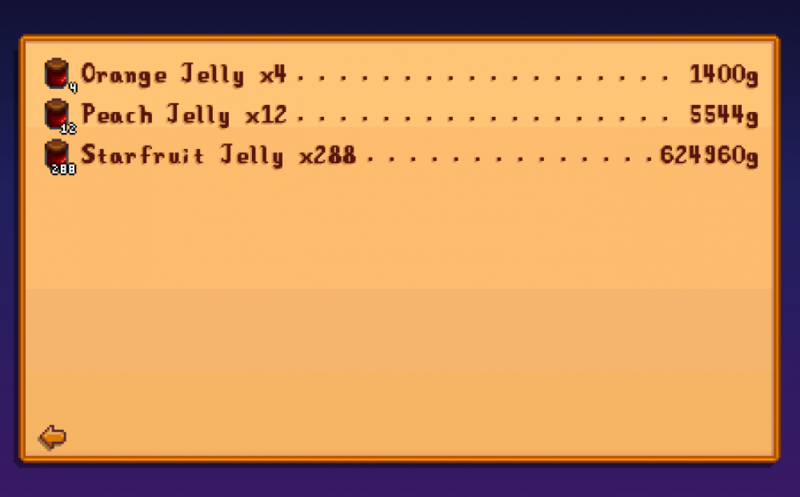 Once I discovered it was more profitable to preserve, then buy the raw materials to make more jars, things really took off. Also got grandpas statue, although once I get my tools upgraded, I really won't need the iridium. Sitting on 40+ Ancient Seeds, just waiting on my Cauliflower to grow so I can get my green house. I have decided to build a big fruit farm. 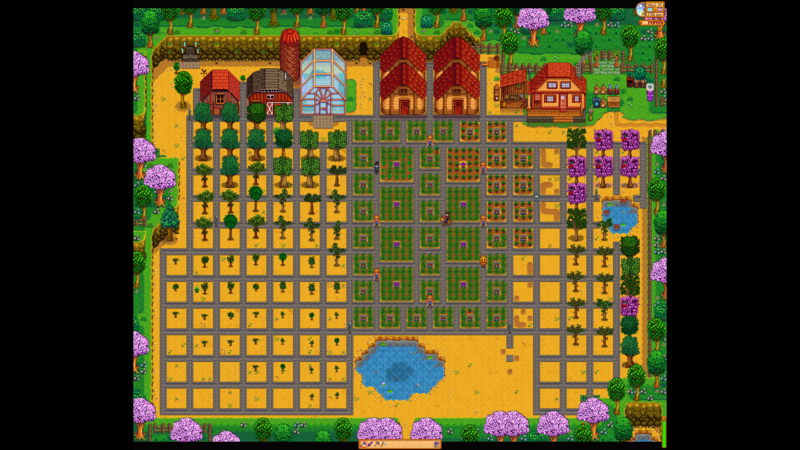 300+ spaces for crops and 120ish fruit trees. 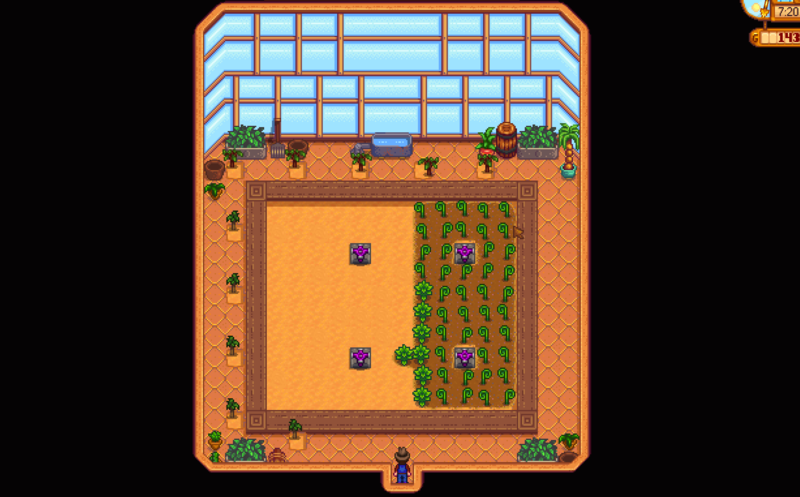 My farm is under development, but way ahead of schedule. I'll get some pics soon. Just need to install all that stuff. Oh, Haley and I had a baby ... Brooke is crawling around the house. Everyone is happy. This game sounds riveting! 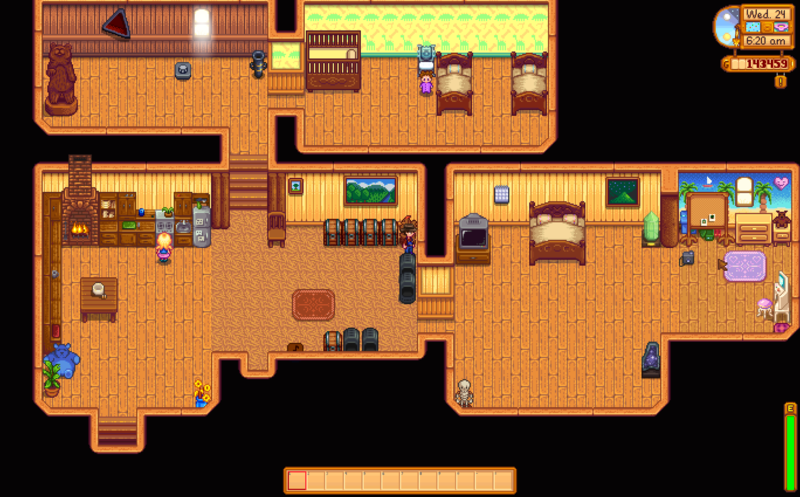 Just a few more hours played until you have 4 kids, a fridged wife and a mortgage! I read that with the intended bit of sarcasm. The game is fun in its own way ... and as I mentioned in my review much earlier in this thread, totally lacking in testosterone. But that doesn't make it a bad game. There are plenty of enjoyable gaming features ... sans blood, guts and death. No "Bam! Headshot!" The graphics are not realistic, but they work. There is a certain satisfaction in seeing your efforts take on a life of their own, and seeing the results of planning and dedication. Some guys like to maintain a meticulous lawn (btw, I'm not one of them), and some of the pleasure derived from playing SV is along that line ... enjoying the fruits of your creativity and labor (so to speak). 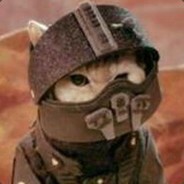 The developer created a nice social setting to explore, complete with individual personalities (if not a bit stereotypical at times), and multiple ways the player may co-exist within that social setting. With extra emphasis on the word "nice". And that is OK. It may not be for everyone. And that is OK, too. Payday! I know its not an aged ancient fruit wine payday, but I'm working towards that. The infrastructure is almost built. Nice. The advantage that jellies and jams have over wine is that you can produce them faster. And I believe, IIRC, that translates into greater profit in the long run. But it is more work ... loading and unloading the bins more frequently. I may do some rearranging of my sidewalks and sprinklers to take advantage of the iridium 3x6 tool setup. I get it. I too like city builders such as banished, collecting pretty clothes in LOTRO, and exploring this part of the games that have it. It is just funny to see it talked about when I don't have any context through experience. You motivated me to clean up and get organized. Over the winter, I went from a mom and pop shop that was wondering what I should do to a mechanized industrial complex with a purpose. I can finally say it: I'm a bad influence! I am at an interesting point in the game. 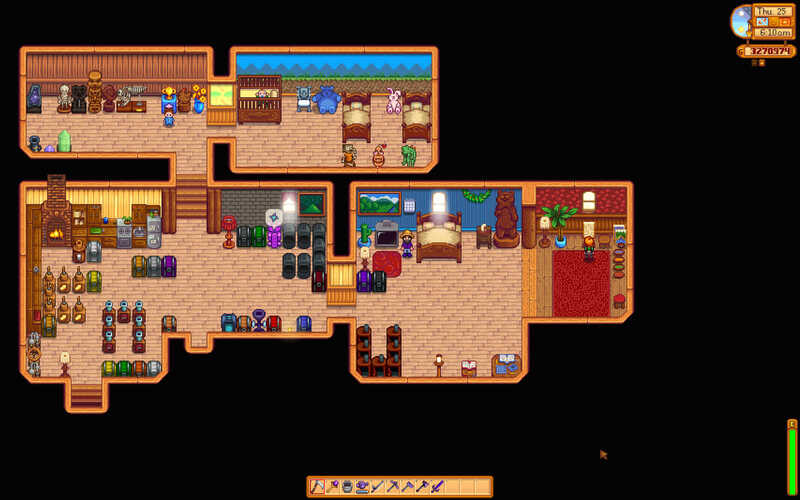 I am at year 3 and almost done with Summer. During the first 2 Summers, I planted blueberries. This year, I planted Starfruit with rapid grow. This enabled me to get 3 harvests. Starfruit is a game changer economically as I am much further along than I ever thought I would be. Combine that with grandpa's statue, and I have more Iridium than I know what to do with. My farm is finished and my days consist of harvesting and fishing. I have bought everything I need and with this next harvest, I will blow past the 2 million for the Return Scepter. I didn't know about The Mysterious Qi quest to get the Casino. Deciding what to do. Finishing the community center will be difficult as I need a duck feather. I might re-roll and try an animal farm. Just buy a duck ... or check the cart for one. But you're right ... eventually you will run out of things to do while suffering an embarrassment of riches. At that point, I've found it is best to turn to Jazz, and then point and laugh at how far behind he is. You frequently tag YMMV "Your milage may vary"? Is that what you mean to say, because it seems superfluous. I could tag with IMHO, but that might be obvious and not exhibit precise word choice. YMMV indicates that your experience (or expectation, as the case may be) may or may not match mine as described. And explicitly implies that I'm not to be held accountable for those potentioal differences - especially if they're negative. I think that is overdoing it a bit, don't you? All content, information and opinions (collectively, the “Material”) presented on the Kitchen Table MTG Discussion Board at www.kitchentablemtg.com (the “Discussion Board”) by Jag are those of Jag and not Kitchentablemtg. This disclaimer applies to (a) all postings to the Kitchentablemtg Discussion Board and (b) both authors of posts to the Discussion Board and readers of the Discussion Board. Jag disclaims all liability for and does not guarantee the reliability, completeness, accuracy, timeliness or currency of the material presented on the Discussion Board. The material is published “as is”, and does not represent the official views and opinions of Kitchentablemtg. You agree to indemnify, defend and hold Kitchentablemtg and its principals, employees, contractors, suppliers, and agents harmless from any and all claims and/or demands, including reasonable attorneys’ fees, made by any third party in connection with or arising out of (a) any use or misuse by you (or anyone using your account) of the Discussion Board; (b) any act or omission to act by you related to the Discussion Board or any Material, or (c) harm of any kind caused to any third party in any way involving the Discussion Board or any Material. Any reliance upon the Material presented on these forums shall be at User’s own risk. Kitchentablemtg has no obligation to and does not regularly review the substance of the content posted by Jag on these forums and is therefore not responsible for any of such content. Kitchentablemtg merely provides a space for its users to express and exchange their own opinions.